After yesterday’s warnings from Nvidia (NVDA), there’s been some dueling analyst commentary in the stock this morning. While UBS upgraded the stock to a buy rating, both Morgan Stanley and Needham downgraded the stock. Needham even thinks the stock could drop below $100. 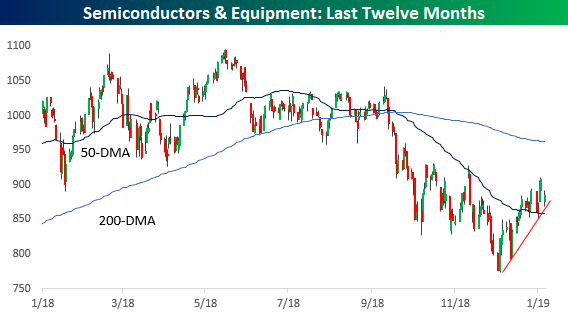 While the analysts disagree on NVDA, the semis held up reasonably well yesterday given the warning. As shown in the chart below, while the group opened weaker on the day yesterday, it held support at the short-term uptrend off the December lows and finished the day up nearly 2% from its early lows.